Lure of the lock is THE Book! One the best books of this type ever written about locks and the history of locks and keys"
This is an actual lock bolt from the Roman era. They are around 2 to 3 inches in length and each one is about 2000 years old. They sell for between $10 to over $100 elsewhere. They would make a fantasitic gift. Order The Lure Of The Lock from us and we'll be happy to include one with your order for free! Offer good until we run out of books or bolts. The John M. Mossman Collection By Albert A. Hopkins New York Copyright 1928 - by The General Society of Mechanics and Tradesmen Reprinted 1954 and I believe another reprint more recently. 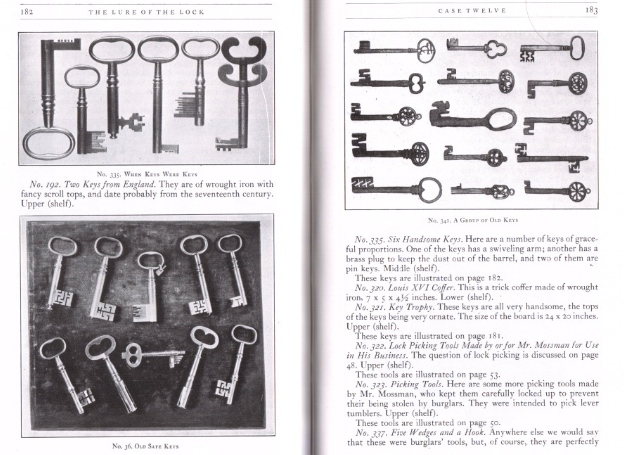 A landmark book with 500 pictures and illustrations that takes you from the very first locks and keys up to present times. Great stories and lots of interesting facts. You'll get an education reading this book! Although it's out of print, and has become somewhat rare we have accesss to a few new copies! This book is sometimes offered on the out of print section of Barnes & Noble in very used condition for between $160 and $220! Note: These are brand new - not all beaten up and dog eared like a few we have seen for sale over the years for double and triple the price. But they are the reprints and not the original 1928 edition Only a very few left - once these are gone they'll be gone forever!